This morning I got to school and was told that one of our large flower pots had been dumped. One thing we always try to do with any kind of vandalism is to clean it up immediately. As kids were just arriving to school, I walked out there with a shovel and broom to replant the wonderful flowers that were planted by our Parent Advisory Council (PAC). As I was busy chatting with parents and discussing comments about “darn teenagers” and “why would someone do this”, a handful of 6 and 7 year-olds. decided to not worry about the reasons this happened and just decided to help. 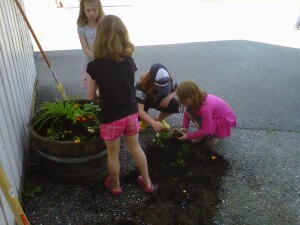 We laughed and worked together to plant the flowers back in the pot as we discussed “putting the flowers in their home” and all the cool insects that were spotted. It led me to wonder – how often do we get caught up on the negatives instead of working collaboratively to solve the problem and, in effect, making the challenge a learning experience? Thanks to these amazing students with young, positive minds, this negative incident was turned into such a great moment; they jumped at the chance to help without any reward attached and without me even asking. What a great example of the power of intrinsic motivation and the desire to “just” help because it is the right thing to do. Yet another lesson taught to me by the amazing students of Kent Elementary! What a great way to start my week! Amazing things can happen when our mindset is not fixed. Isn’t it wonderful what we as adults can learn from kids. This is why kids are so good at lemonade stands (because that’s what they make from the lemons life hands them)! Glad that I could help..Mr Wejr. Always looking through the camera..